Work has started on our new 3G Stadium development in conjunction with our partners in the scheme, Stockton 6th Form College. In the coming weeks this page will be developed to keep you informed of the opening and timetable for the use of the new facility. In the meantime a little flavour of how the new facility will be used and the benefits it will bring to many. It will also host some of our junior teams matches on Sundays and the winter training sessions of all our teams in the coming years. Stockton 6th Form College already run a number of sports related courses that have a fantastic reputation within the local community. These facilities will be utilised by the College to further enhance their course’s and ensure the students and people of Stockton have the best facilities possible. The College will also utilise the pitch for their enrichment football matches and hopefully will be able to increase the number of players involved in the coming years. Finally the Club hopes the people of Stockton utilise the facility for recreational football and the Club will look to engage them by offering opportunities across the ages to be involved in playing football. 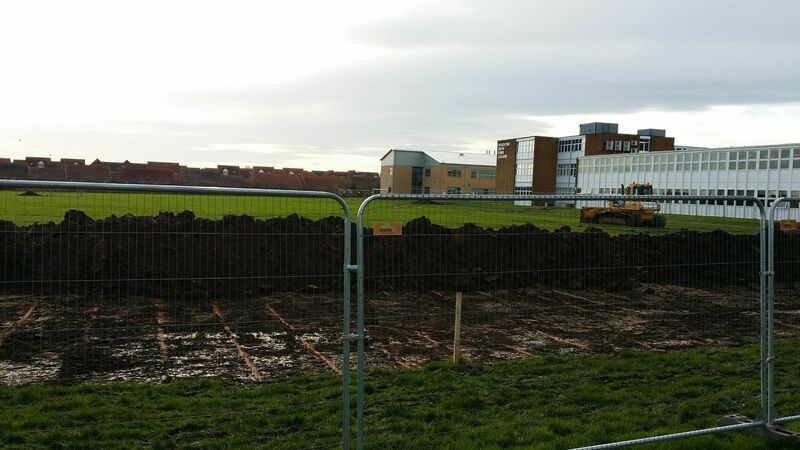 Construction starts on the new 3G Stadium development at Stockton Town & Stockton 6th Form College.